Jesse E. Martinez, General Manager of the award winning Alfond Inn at Rollins. With his strong leadership the hotel has been globally and nationally recognized by Travel & Leisure and Conde Nast as Top 100 Hotels in the World, the Best Hotel in the State of Florida along with being ranked in the top 10 best hotels in the U.S.
Martinez is a seasoned management professional with 19 years of hospitality leadership experience in luxury and convention business. 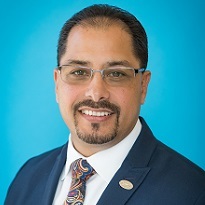 He has served in upper management positions to include General Manager with AAA Four Diamond branded hotels such as Marriott, Hilton and Starwood and Area Security Director for Hilton Hotels San Antonio. Martinez has been awarded the General Manager of the Year for Crescent Hotel & Resorts and Yedla Hotels. He received his Bachelor of Arts degree from the University of Texas at San Antonio and a Criminal Justice Associates Degree from the Community College of the Air Force. Martinez is a 22 year veteran of the United States Air Force, retiring in January of 2011. He currently serves as the Treasurer of the Central Florida Hotel Lodging Association, sits on the Orange County Tourism Development Council, serves on the Executive Committee of the Winter Park Chamber of Commerce, a member of SKAL Orlando Chapter and is a graduate of Leadership Winter Park Class 26.